Tonight seemed like a good time to read my Blofeld. John Blofeld’s translation of the I Ching (Yijing) has always been my favorite. This most ancient of books always offers value. 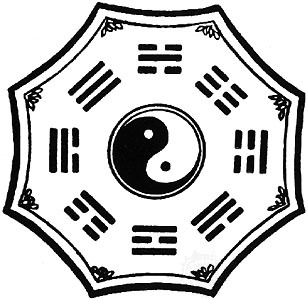 In my youth, studying Baguazhang (8 Trigram Palm), specifically Jiulong Baguazhang with my Grand Shifu John P. Painter, we lived the trigrams and hexagrams of the Yijing. Every night we leaped and spun and crawled and kicked and dodged and struck with the open palm whilst envisioning various aspects of the 8 trigrams and the 64 hexagrams of the Yijing. Fruit posture, whilst the other palm waited in a yin position at waist height. This was Heaven and Earth, in the Wade-Giles spelling, Ch’ien and K’un. If Earth was ascendent then the hexagram was T’ai, Peace, Heaven and Earth were in accord and all was well. But, if Ch’ien was uppermost then Heaven and Earth were disparate, apart, and Stagnation resulted. In the martial art these were but one of many combinations, thousands when stance was included, and they might be strikes or blocks or both. Both palms uplifted was Ch’ien and represented the people reaching upward to accept gifts from the gods. Two palms down, K’un, the gods bestowed gifts on the people. So combine them and either T’ai or P’i would result. Good or bad. 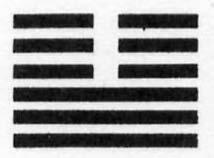 In meditation each night we would consider a trigram or a hexagram depending on the present stage of training. 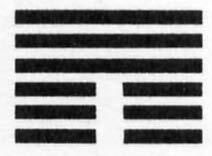 There were also eight short forms, one for each trigram. I was particularly fond of Tui, Lake. And Tui can also be a pool or a marsh or…Joy. It all depended on the circumstances. Those were heady times moving and being still. Meditation was often deep and Wushu practice could be incredibly rewarding. When the mind and body move together there is a feeling of oneness with the universe. The mind commands, the body moves, qi flows. So, tonight I decided to see what my Blofeld had to say. As I threw the coins and the hexagram grew from bottom to top I knew immediately what I had. And although I do not believe in much more than the quantum flow of the universe, I am never pleased to see Heaven above Earth, P’i, Stagnation. Well, declining temptation is usually a sound idea. And, if you study the Yijing, this was a hexagram of stagnation not a stagnant hexagram. It had changing lines. So in the theory of the Yijing, the hexagram represents the present. Reverse the changing lines and you have the near future. I have not yet looked into the future. Tonight I will withdraw into myself and contemplate the now which I too often eschew. 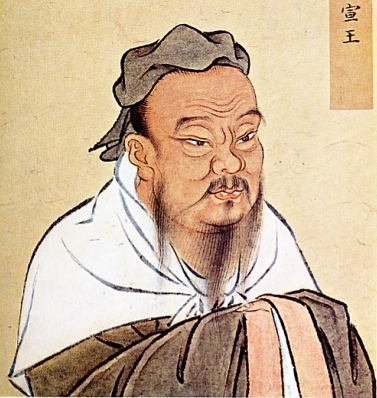 The Yijing talks about the Superior Man, I prefer to think of it as “The Superior Being” and when I was leaping and punching and rolling and blocking, I often took action based upon the advice of the Book of Change. Many years passed before I began to realize that if one were not the Superior Being of Kung Fu-tse (Confucius-who evidently heavily edited the Yijing just as something to do), if one is not a Superior Being (right acting?) then look out if you tried to take the advice of that ol’ I Ching. Ha, I damn near bought the farm, figuratively anyway, by trying to act upon “The Superior Being stakes one’s life on following one’s will.” Woo. Try using your will as a guide and not being one of those Superior-type folk. Man, you can get into a lot of trouble. On the other hand, the Book of Change helped me craft a motto for my tai chi teacher of which I am still proud. “The Superior Person seeks harmony, not sameness.” This can be taken many ways, but even just literally in relation to tai chi practice it means every damn time you practice your tai chi strive to get better. Sameness is not enough. So, I guess I better get to withdrawing and contemplating before I bite off more than I can eschew. Tomorrow I will look at what the changing lines bring, but I already know that Tui is one of the trigrams in that new equation. I hope it is the Joy part. And, even though the Yijing is not a true oracle, it always offers good advice. the way that endures forever.